If you’re just getting acquainted with the Homestead Village way of life, you’re probably curious about who calls our community “home” – not only our residents, but our dedicated caregivers, nurses, and professional staff, as well. It’s true that we employ a large team whose mission it is to provide compassionate care and be of service to all of our residents. Today’s post will familiarize you with our various administrative departments and show how these individuals uphold our values in their daily work lives. 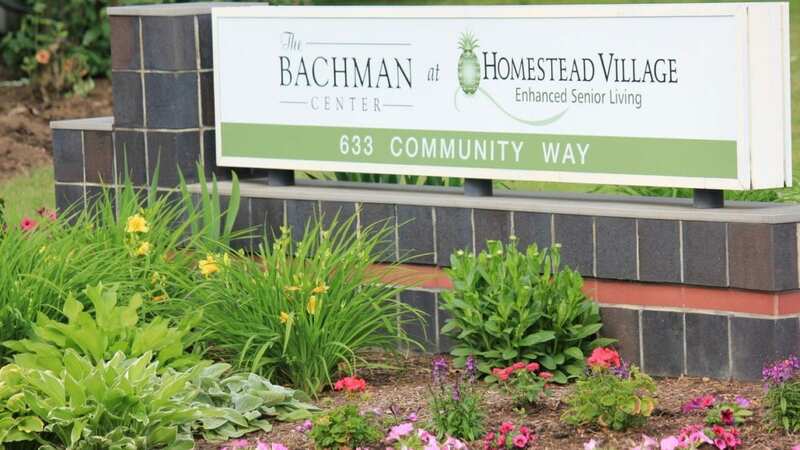 Our largest department here at Homestead Village is named after the physical campus location where the 90+ member skilled nursing team performs their work, the Apostles Center for Care. The ACC is arranged into three households of 15-22 residents each, which enables team members to create a warm and personalized environment suited to helping each resident achieve maximum independence. It’s true that these unique households become like extended families for both those who live there and those who serve professionally. Each ACC household is charged with working together efficiently with a high degree of trust to provide the highest-quality, most home-like care. This involves collaboration between leadership roles in the department, who advise a talented and compassionate nursing staff of Registered Nurses, Licensed Practical Nurses, and Certified Nursing Assistants (RNs, LPNs, and CNAs). The department also includes several Life Enrichment team members, a scheduler, and medical records staff. The Personal Care department at Homestead Village offers residents in campus apartments Supportive Services over the long term or for shorter periods right where they live. In fact, our Life Plan Community is currently the only one in Lancaster County that offers this unique option. Residents are able to thrive where they are, and they will never have to relocate from their comfortable dwelling just because their care needs change over time. Such excellent care is made possible by a dedicated team of LPNs, CNAs, and PCAs (Personal Care Assistants) that serve under our Personal Care Home Administrator, who is responsible for overseeing all of the services and staff in Supportive Services and our Westvue building (the location of Harvest and Gelhard Houses). There is also an Administrative Assistant who provides clerical support to the Personal Care department, as well as several Life Enrichment team members. As you may already know, Homestead Village is committed to the concept of THRIVE WHERE YOU ARE®. This mindset drives our community to provide high-quality services and care to residents where they live, which may not even be on our campus. Home Care offers a reliable support system that helps individuals from all walks of life maintain their valued independence in the comfort of their own homes. Home Care staff includes a growing team of LPNs and CNAs, as well as Companions. This latter group of employees is available to provide homemaker-related services such as conversation and company, light housekeeping and laundry, meal preparation, shopping, and even hosting assistance for private gatherings, from setup to cleanup! Our Independent Living team is a small but mighty resource for those residents who do not presently require care services. The team supports these individuals who have simply chosen to downsize their maintenance and supersize their happiness by moving to one of Homestead Village’s array of senior living options, like our beautiful Farmstead carriage homes. A Nurse, Chaplain, and a Social Worker are always available to help residents thrive, but the Independent Living team focuses heavily on Life Enrichment activities and fun events and trips for community members. The team that brings residents convenient transportation options and maintains the beauty and safety of our wonderful Life Plan Community is known as Environmental Services. These hardworking employees handle housekeeping, laundry, grounds care, and maintenance throughout Homestead Village’s main campus and The Farmstead. While this team mostly works behind the scenes, their presence is undoubtedly appreciated every day. At Homestead Village, we take food very seriously, which is why we partner with professional dining services operator, Cura, to bring our residents the best possible options and menus. Last but certainly not least, Homestead Village as an organization is operated and promoted by a team of professionals led by our President, Douglas Motter, and governed by a volunteer Board of Directors. Leadership is openly collaborative with residents, who are valued as the most important stakeholders in the Homestead Village organization. The office administration team includes Accounting, Marketing, and Human Resources staffs, as well as several receptionists, who provide friendly and helpful coverage at the front desk from 8:30 a.m. to 9 p.m. Monday through Friday and 9 a.m. to 9 p.m. on Saturday and Sunday each week. If you’re looking for a caring Life Plan Community to call home, whether as a resident or in a professional service role, Homestead Village is second to none in Pennsylvania and our larger region. Get in contact today to discover how we can help you THRIVE WHERE YOU ARE®.